Kosovo: Energy transition feasible despite 97% lignite fired-generation? | Germanwatch e.V. Im Juli 2018 stellte Martin Schön-Chanishvili in Pristina die Studie "Phasing in Renewables" vor. In the beginning of July, Germanwatch published its Kosovo research study “Phasing in Renewables“ and discussed it in Pristina with development organisations, ministries, business, NGOs and academia. Kosovo faces quite typical challenges of the Western Balkans, being heavily reliant on lignite use for power generation and struggling with serious social and economic problems. Therefore, Germanwatch and the Balkan Green Foundation joined in a project to assist an energy transition in the Kosovo. The project is funded by the German Federal Ministry for Economic Cooperation and Development (BMZ). The discussion on the Germanwatch study was kick-offed by a focused and critical statement from leading staff of the Kosovo transmission system operator KOSTT: “There is no doubt that renewables are reasonable to develop, but we have to guarantee security of supply. Can renewables replace lignite? After all, we hold the fifth largest lignite deposits worldwide!” KOSTT is member in the 15-headed core group of the current Germanwatch Kosovo Project, consisting of middle ministerial management, expert agencies, NGOs and academia (see Box Project "A multi-stakeholder-partnership for the energy transition in Kosovo). Germanwatch's and BGF's study sends a clear message: Not only is an energy transition technically possible, given the country's great potentials in wind and solar (see a recent IRENA study), as well as excellent options for connections to Albanian hydropower. An energy transition even is a necessity in order to reduce CO2 emissions, improve air quality and open up economic and social opportunities for Europe’s youngest country. In the study, ten authors from across science, consulting and practical implementation outline challenges and possible solutions for Kosovo based on experiences in other countries. The study throws a light on three kinds of challenges: Technological, economic and juridical, as well as possible chances of circular migration. The authors offer best practice and solutions, which are intended to be a basis for discussion and an inspirational source for the Kosovo discourse on the energy transition to come. Various benefits of an energy transition for Kosovo are depicted and analysed: Technological innovation, economic growth, jobs, return of the diaspora, stabilisation of rural areas and peace building through regional cooperation. The study shows that there are solutions for all kinds of technical challenges connected to a phase-in of renewables. These solutions are successfully tested and implemented in other countries. Thus, a focus for an energy transition should be on regional energy market integration, grid expansion and storage technologies. Economically, the key challenge will be to lower the high financing costs for renewables projects in Kosovo. Additionally, the legal basis has to be adjusted to ensure a long-term planning perspective for investors. All in all, the study shows that the greatest obstacle for the Kosovan energy transition will be the political mindset: Up till now, there is a political bias in favour of lignite as opposed to renewables. Yet renewables would pose a sustainable and promising solution for a well interconnected western Balkan, since the countries' potentials complement each other well in terms of fluctuating wind and solar energy, as well as the controllable generation of power generation from hydro. Project: "A multi-stakeholder-partnership for the energy transition in Kosovo"
Objective: Development of a politically and societally shared vision for the energy transition and concrete steps on implementation in Kosovo, embedded in the regional perspective of the Western Balkans. 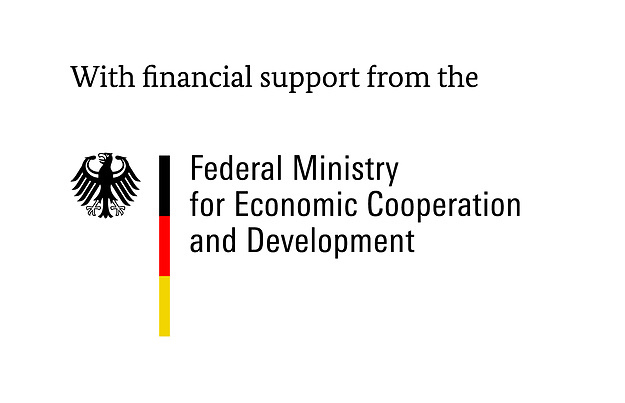 Funding is provided by the German Federal Ministry of Economic Cooperation and Development (BMZ) through Engagement Global. Approach: The project brings together core stakeholders from politics, administration, civil society, business and academia. Together they develop a common vision for an energy transition in Kosovo and define concrete steps for implementation. This vision shall take into account the challenges and needs of the broader population in Kosovo. The project uses existing European and German know-how and experience with an energy transition - technically, as well as politically. Activities: The project offers expert know-how and support for dialogue. The kick-off statement by KOSTT reminds the up-to-date and controversial discussions in Germany about a "coal exit": Security of supply and resources at hand are the key arguments for an ongoing and intense use of coal and, basically, against a fast energy transition. But in times of decreasing costs for renewables generation and the massive pull-out of investors and insurance companies from fossil fuel projects, Kosovo will most likely be suspected to “stranded investments” if it keeps clinging to lignite. As the 2017 SEERMAP Study shows, conventional power plants will lose their ability to compete, once an effective CO2 price has been established. A scenario which is very likely during the investment cycle of a power plant. The study emphasises an apparent challenge for the Balkans on the whole. The region's energy sector is heavily reliant on coal – in 2017, 37 power plant blocs were active in five countries and 13 new plants are being planned throughout the region of south-eastern Europe, many of them with Chinese investment. Kosovo in particular is the "lignite champion" in the region, generating 97% of its electricity through lignite. At the same time, Kosovo faces diverse social, economic and political challenges, which are symptomatic for the region: Unemployment rates reach 30% and 56% amongst young citizens, respectively; energy efficiency is insufficient (30% in the energy transmission grid alone); and the country is not officially recognized by Serbia, one of its most important neighbours. Thus, a successful and regionally integrated Kosovo energy transition can serve as a best practice example for the entire region. That’s why Germanwatch and the Balkan Green Foundation started the project “A multi-stakeholder-partnership for the energy transition in Kosovo” supported by Engagement Global and funded by BMZ. The project offers German as well as European know-how and unites key players within Kosovo to work on a vision and roadmap for an energy transition. The core group, made up of representatives from politics, administration, business, civil society and academia, will then propose recommendations for the planned update of the Energy Strategy of Kosovo. These results will be handed to the government of Kosovo by 2020. The project will also initiate two small lighthouse projects, chosen by a jury. GIZ Cluster Coordinator Environment Kai Hofmann, Dardan Sejdiu (center) from the Parliamentary Committee on Economic Development and Deputy Director Energy Community Secretariat Dirk Buschle (from left to right). Presentation of the project at the conference "Kosovo Sustainable Development Week" on June 4, 2018. In Pristina, GIZ, KfW and the German embassy also took part in project events. German actors of foreign policy and development cooperation already give substancial impulses in the energy sector, mainly through projects in energy efficiency and pro-active public statements in favor of an energy transition. But so far, there is no direct German engagement for renewables in Kosovo. KfW helped Kosovo with the strongly needed integration in the regional energy market by building a power line with Albania, a county that completely fulfils its electricity demand through hydro generation. Meanwhile, due to political controversies with Serbia, the line cannot be used. This conflict, causing even frequency deviation in the European energy market, went through the European media and specialized press multiple times. How to go on with coal? 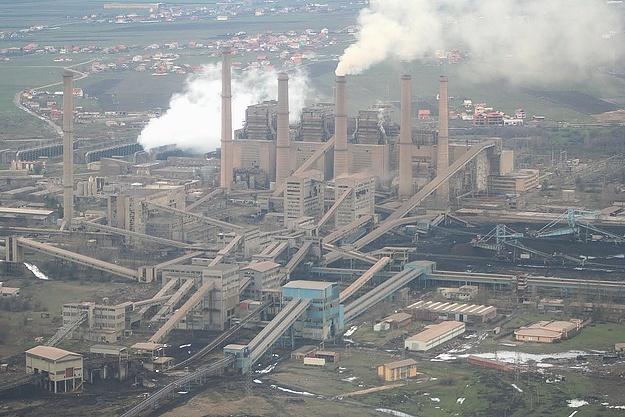 There is an urgent need for immediate action since the existing coal power plants in Kosovo are way overdue, and the Kosovo A power plant has become “the worst singular emission source in Europe”, according to the World Bank. Whilst the power plant Kosovo B, built in 1977-1984, is still intact, the power plant Kosovo A should have already been shut down. It was built in 1960 to 1975 and has already exceeded its technological lifespan by far. After an explosion in the Kosovo A power plant in 2014, new electric filters had been installed. This lead to a reduction of dust emissions. Meanwhile, emissions of other dangerous pollutants like nitrogen dioxide still remain on a substantially higher level than permitted by european emissions directives. Yet, what route will coal take in Kosovo? For years, politics have been eyeing the possibility to build a new lignite power plant called “Kosova e Re” – New Kosovo – with strong support by the American government. But the project is highly controversial and hasn’t made any progress in the past years. The World Bank publicly questions whether or not it will actually hold on to its initial and crucial pledge to back up the project financially. Meanwhile, the policy pressure on Western Balkan, further southeastern European and Caucasian countries is rapidly growing: Within the scope of the Energy Community (EnC) Treaty, six western Balkan Countries as well as Georgia, Ukraine and Moldova committed to adapt their laws and regulations to the European Energy Legislation. Since the beginning of 2018, they also have to comply with the EU emission standards for power plants, which are out of reach for old power plants. On top of that, the Energy Community Secretariat has put climate policy explicitly high on the agenda in their new Wachau Manifesto and urges member states to set more ambitious targets for renewables, energy efficiency and revise their NDC to be in line with the Paris Agreement. Accordingly, national Climate Energy Plans are going to be negotiated in two technical working groups this year. However, progress in achieving even the basic EnC- targets concerning an energy transition is slow. The latter mainly consist of better energy efficiency, sustainable energy systems, climate mitigation and the liberalisation of energy markets. Kosovo has set a highly ambitious goal of getting 29.5% of its gross final energy consumption from renewable energy sources until 2020. Meanwhile, even if one counts the non-sustainable use of wood with expired technologies, Kosovo could only achieve 18% in 2017. “We need serious political will so that new projects for renewable energies can be planned and implemented”, explains Arbnor Kastrati, vice chairman of the renewable energy organisation in Kosovo, on the event that was hosted by Germanwatch and Balkan Green Foundation. In order to create more momentum, the core group will now discuss the topic “Security of supply and grid expansion for renewables” in the beginning of October 2018 during a workshop. German and Kosovo experts are going to shape ideas and solutions together with the stakeholders. Thus, the transmission system operator’s initial, critical concerns will be accounted for. Security of supply and grid expansion were also prioritized by other members of the core team. The same subjects have been identified by the Energy Community Secretariat as crucial for an energy transition in the Wachau Manifesto. The Study “Phasing in Renewables” has hence fulfilled its initial purpose: It demonstrated challenges, brought together decision makers and set the basis for the discussion around the Kosovo energy transition. A short overview on main data of the Kosovo energy sector is available on the Balkan Energy Prospect’s website.